The PLR-22 pistol is chambered for the popular and economical .22 Long Rifle cartridge (.22LR). It is based on the 5.56mm NATO chambered PLR-16 pistol and shares many parts including the grip and front and rear sights. The PLR-22 is not a simple conversion kit, it is a standalone firearm chambered for the .22LR and is designed for target shooting, plinking, or small game hunting. The PLR-22 and SU-22 operate by blowback action and have a 4140 steel bolt that rides on steel guide rails inside the polymer receiver. The ejector is attached to one of the guide rails and the recoil spring is located above the barrel. 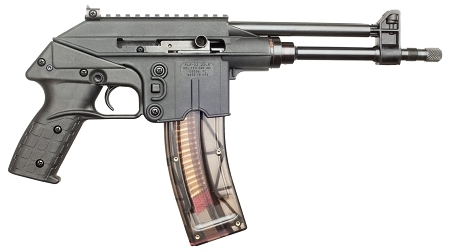 The cross-bolt safety and magazine release operate identically to the PLR-16 and SU-16.